DIY market of Russia. The results of 2013. Forecast till 2017. In the report "DIY market of Russia. The results of 2013. Forecast till 2017" the development of DIY market is characterized including forecast till 2017. There is also a comparable analysis and structured description of the largest DIY market players. In the report IA INFOline’s analytics characterized the main trends of Russian DIY market development, composed the rating TOP-50 largest DIY operators of Russia by the results of 2013, which includes the indicators of net revenue, revenue by square meter of space, amount of commercial objects and aggregate commercial space by 01.01.2014. In the report there is also dynamics of development of organized retail and wholesale-retail formats at DIY market of Russia is described, the major players of formats like hypermarket, construction wholesaler and specialized shopping center are described, information about distributive centers of the largest DIY chains of Russia is presented, information about consumer preferences of Russians in relation to construction goods is presented. DIY Store Chains of Russia analytic database. 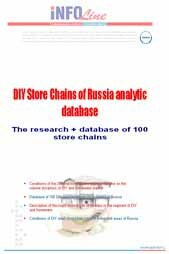 100 DIY Store Chains of Russia Analytic Database research contains the following sections: Section I. 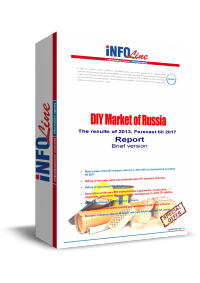 Description of DIY and homeware stores of Russia, which contains description of DIY and homeware segment, evaluation of DIY market structure and volume, as well as the analyses of the present conditions and development outlooks for DIY market of Russia. Section II. Trends and development outlooks of the construction market in Russia and its regional structure, which analyses the conditions of the construction segment and its influence on the conditions and development outlooks of DIY and homeware market in Russia. Section III. Description of DIY and homeware store chains of Russia, which contains figures of operating and financial performance, regional representation and development outlooks for 11 major companies in DIY and homeware segment in Russia. Besides, this section contains a rating of DIY chains according to sales volumes, trading floor space and number of trading units. DIY Store Chains Russia Analytical Database research includes information about 100 DIY and homeware chains that contain 880 stores (including about 250 hypermarkets, more than 360 supermarkets) with total trading floor space of more than 2.5 million square meters and sales of more than 10 billion US dollars.